Each year, you may receive several different types of income documents that you must report on your federal income tax return. There are many varieties of common 1099 forms and it can be confusing to figure out where you should report the income reported on each 1099. When third parties issue a 1099 to you, the same information is reported to the IRS. The IRS matches 1099 information received from the issuing companies to items reported on your tax return, so it's essential to report 1099 items on the correct form. The 1099-MISC is one of the most common 1099 income forms. Income from these forms must be reported on one of several different IRS income tax forms, depending on the type of income shown on the 1099. Box 1 (Rents) - If your 1099 shows income in box one, report amounts received from the rental of residential property on Schedule E. If you received income from renting property other than residential property, report the income on Schedule C.
Box 2 (Royalties) - If you receive royalty income from copyrights, oil, gas or mineral rights you own, report the income on Schedule E.
Box 3 (Other Income) - Report this income on the first page of Form 1040 on line 21, Other Income. Box 7 (Nonemployee Compensation) - Report nonemployee compensation on Schedule C. You may also claim expenses on Schedule C to reduce your taxable 1099 income. A 1099-S is issued when you sell residential property, such as your personal home or a rental home you own. If the sale concerns your main home, report the 1099-S income on Schedule D. If you live in the home you sold for three out of the last five years, you may exclude up to $250,000 of gain ($500,000 if married filing jointly) from your taxable income; however you must still report the 1099-S income on Schedule D. If the sale concerns residential rental property, report the 1099-S income on Form 4797. This form is issued when you receive distributions from a Health Savings Account (HSA) or Archer Medical Savings Account (Archer MSA). Report 1099-SA income on Form 8889 if the distributions are from an HSA, or Form 8853 if the distributions are from an Archer MSA. Income reported on a 1099-A or 1099-C is the result of cancelled debt. You may receive a 1099-A if you had a home foreclosed on. You may receive a 1099-C if a credit card company or other lending institution charged off your debt obligation. You may owe income tax on the amount discharged, unless you were bankrupt or insolvent immediately before the discharge or foreclosure. In this scenario, you are insolvent if your total debt from all sources equals more than the value of all your assets. Report your insolvency or bankruptcy on Form 982. If you were not bankrupt or insolvent, report 1099-C income on Form 1040 line 21, Other Income. If you receive 1099-A income, report the transaction on Schedule D. The same exclusion from gains applies to balances from foreclosures of personal residential property. If you receive certain government payments, you will receive a 1099-G at the end of the year. Some states that issue forms 1099-G do not use a traditional 1099 form. The 1099-G you receive may resemble a postcard, so if you received unemployment compensation or a prior year state income tax refund, watch your mail carefully in January for this 1099. 1099-G income from these sources must be reported directly on your 1040 income tax return in the "Income" section. If you sell certain investments or securities, such as stocks, bonds or mutual funds, you receive a 1099-B. You must report income you receive from this type of sale on Schedule D. If you did not receive a detailed statement regarding your sales transaction, contact your broker. You must report other information, such as your basis in the asset and your original purchase date to correctly calculate any capital gains or losses on your 1099-B income. If you receive dividends from corporate stock, the amount is reported to you on 1099-DIV. If your dividend income is less than $1,500, you may report the amount directly on Form 1040 in the "Income" section. If your total dividend income is more than $1,500, you must report the income on Schedule B, which is an attachment of Schedule A. Interest income you receive from banks or other financial investments is reported to you on a 1099-INT. Report interest income you receive on Form 1040 in the "Income Section". In addition, the value of some free gifts you receive (such as new account gifts from a bank) is considered interest income. You will receive a 1099-INT for the value of your gift if you receive any of these incentives during the year. If you meet certain income requirements, you may be eligible for free assistance in the preparation of your tax return, which includes help with properly reporting your 1099 income. 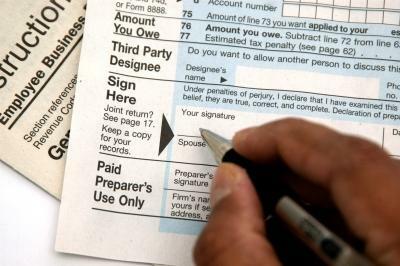 Taxpayers who earn less than $49,000 per year qualify for help through the IRS Volunteer Income Tax Assistance (VITA) program. VITA locations are available in every state. VITA services are also available to those over the age of 60, as well as military personnel and their families, regardless of the amount of income earned. VITA volunteers are certified by the IRS to provide the services offered through the program.